Sturgeon born in mid-September found during an Oct. 31 trawling survey by Rice Rivers Center researchers. The Atlantic sturgeon is among one of the oldest species of fish in the world. The James River used to be chock-full of them, but they were labeled as endangered in 2012. Not one baby sturgeon was found since then. Until now. Researchers were stunned to find native marine life in the James River that's population has been impoverished for decades. The Atlantic sturgeon was labeled as an endangered species in 2012. It's among one of the oldest species of fish in the world and was one of the main species to inhabit the James River. Researchers from the Rice Rivers Center have conducted trips along the James River over the years and have found more than 600 different adult surgeon, but never did spot one baby sturgeon. That is, until last week. 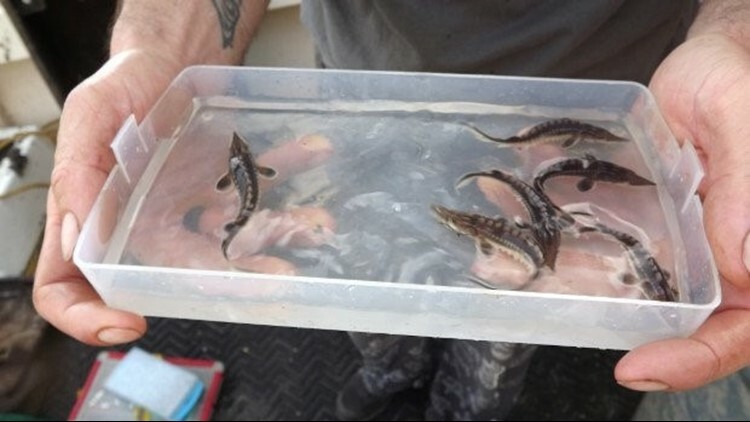 According to a release from VCU, a baby sturgeon appeared in one of the researchers' nets and two dozen more were found as researchers scoured the river over the next several days. As of Nov. 12, that number has climbed to 148. There's a central effort with the Virginia Sturgeon Restoration Team to restore the sturgeon population and fill local waters with these ancient fish again. The Rice Rivers Center is at heart of this effort. Now, researchers are working to identify the babies' drifting patterns and document more key information.